Great value multi purpose pedal. Looking to make a big noise on a small budget?? The gem box is exactly that a little gem. Incorporating a multitude of guitar effects from boutique guitar amps to some of the industries top names this little box even boasts a drum machine, built in tuner, modulation pedal to be able to tweak your effects & assignable patches that let you create your own sounds and recall them at the touch of a button. Compact, lightweight, battery powered go on put some sparkle in your playing with this little gem. A great new effects pedal from Spur. Use the pre-loaded effects, including such favourites as Chorus, Flanger, Phaser and Distortion, or fiddle with the knobs and create your own! You can even save up to 40 of your own effects which are easily accessible with the handy recall function! The built-in drum machine comes with 40 different pre-loaded rhythms and the tempo for all is variable from 60 to 270 BPM allowing you total creative freedom! 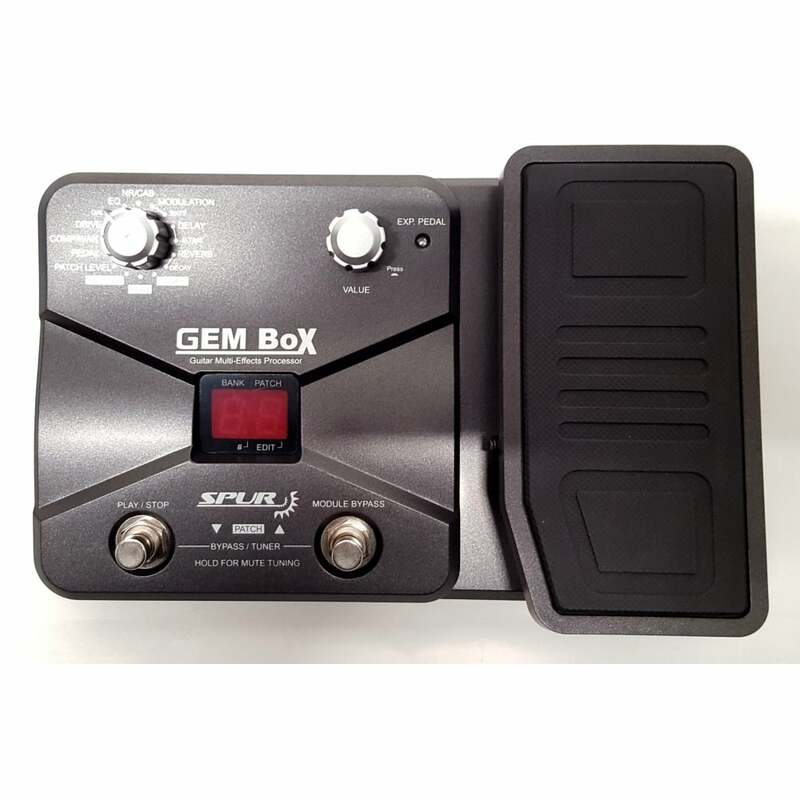 As well as the two foot-switches, the Spur Gem-Box includes an expression pedal which can control the modulation, drive, delay and gain. You can even keep your guitar in tune with the foot-switch-operated Tuning Function. Overall, for the money, this device is quite impressive. The build quality is good, it appears to be robust and well designed. Sound quality is excellent, display is clear. The instruction manual is pretty bad, though. Shows signs of being poorly translated. It's taken me some time to get to grips with the device's potential, as, for probably good reasons, all the available functions are there but hard to get at because there simply aren't enough buttons. Two rotating knobs, two foot switches and the wah pedal are not enough to allow easy access to everything. The built in effects are okay and compare well with those in my Fender Mustang I amp. It's a little challenging to make your own, but maybe that's just me. Built in drum machine is excellent but maybe the range of beats could be wider. It could do with an on/off switch. A pretty good buy. This is a brilliant piece of equipment. Does away with the need for a backing track or a band. Great for creating new music as it's so adaptable. Best gadget I've ever bought. Highly recommended.